School children from London and beyond have donned white lab coats and eye masks for an exciting day of chemistry challenges and experiments at London South Bank University. 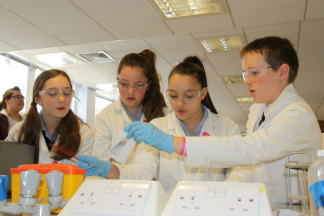 Teams of four pupils from each of the 16 different schools participated in the annual Salters' Festival of Chemistry which aims to get children interested in the sciences. The children were given the opportunity to use their analytical chemistry skills during a competitive, hands-on practical activity trying to solve a crime using forensic lab-testing techniques. This was followed by a University Challenge game, a university-style lecture and finished with a prize-giving at which all participants were given prizes and certificates. The festival at South Bank University is one of 47 festivals taking place in universities throughout the UK between March and June 2014. The Salters' Festivals of Chemistry is an initiative of The Salters' Institute, whose aim is to promote the appreciation of chemistry and related sciences amongst the young, and to encourage careers in the teaching of chemistry and in the UK chemical and allied industries. Dr Anne-Maria Brennan, Principal lecturer at London South Bank University said: "We were delighted to host the children for the fourth year running as part of The Salters' Festivals of Chemistry. It was fantastic to see them take a real interest in the challenges we set them and work hard throughout the day. "All the teams showed excellent problem solving skills, outstanding observational skills and were great team players. It's wonderful to see young people's interest come alive by the challenges and in the subject of chemistry as a whole, and hope it's the start of a lifelong love in science and possible career for them in the future."